Ah literally just finished it. Really enjoyed it and just wanted to give this indie game a lil mention. 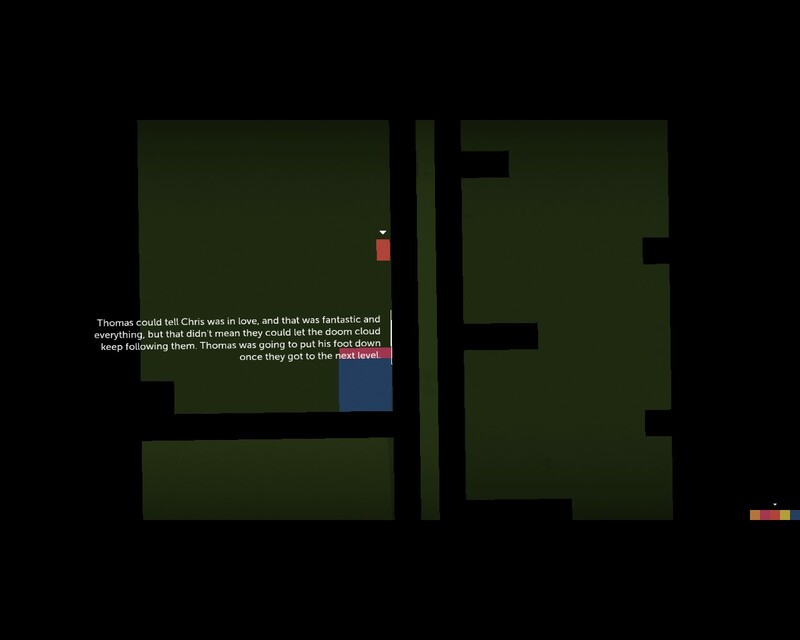 Long story short you play as squares and rectangles representing AI’s, each with their own name, abilities and personalities. Which are all expressed via a narrator, who does a bloody good job and makes me laugh. 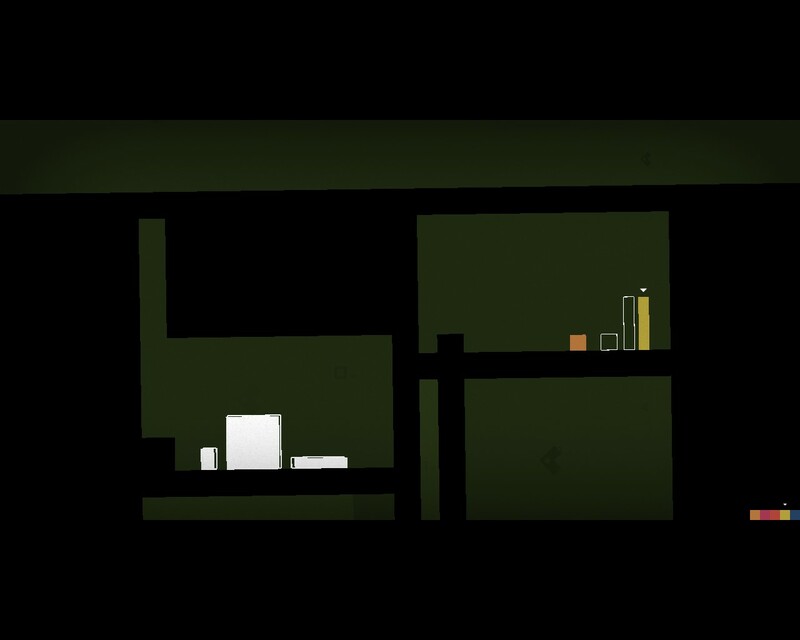 An example above of gameplay. 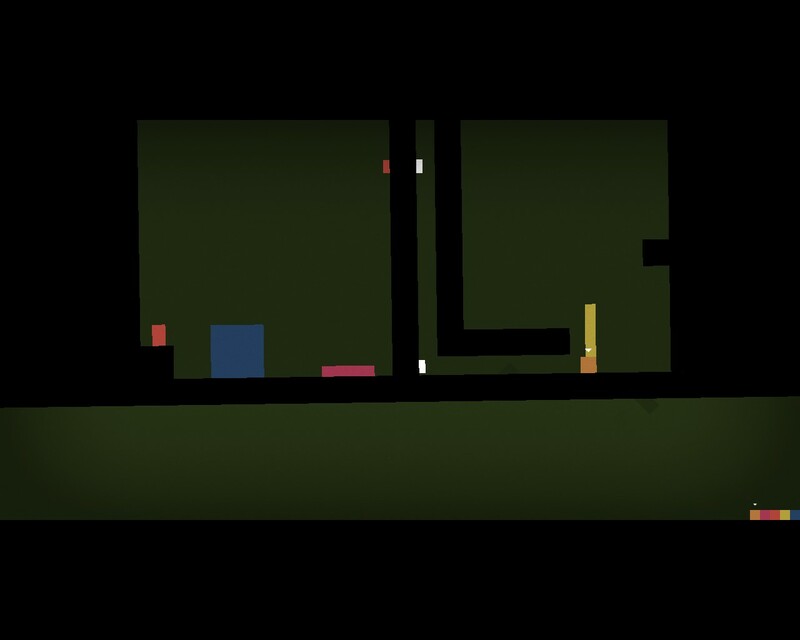 You start a level with many coloured shapes under your control, you swap between them by choice. You help eachother get through the level and usually get some narrative. You aim to get each shape to its own portal, see they turn white when they do, the level is complete when all are in their respective portals. Im not going to say too much about it as I would want people to check it out themselves. Music good job. By David Housden. So tempted to get the soundtrack too. Narrators voice is ace, Danny Wallace its seems to be. Mike Bithell, the creator, good job. Claire does deserve a cape. Since I never get round to doing a blog, Ive started looking after 4 blogs, which is doing me wonders as I always work better with multiple things. When i friend was down we by pure chance found a ale shop in newcastle in a market area, believe its called Glug, and ive keep going back there as they have two solid walls of ales. From the left is a powerhouse 10% russian stout. it was bloodly heavy as well so it took me ages to drink it. though from experience of many stronger and weaker beers, for me personally anything over 8% loses too many flavours, this was certainly the case with the one too. next was a milk chocolate stout….. milk choc rather than dark choc? it was just okay. the founders porter was also a nice drink but with nothing to make me want another. the mocha milk stout was my mates so i only got a taste, not as good as batemans mocha beer. Now old engine oil (also not mine) i fell for a week before this when i found it in a pub. Really dark, really heavy and ill be able to write more tomorrow night as i have another bottle in my posession. I really cant remember this one as i only got a taste and i was at the end of the 10% beast. Unfortunately glug didnt have any when I was there a few days ago, will keep an eye out though. 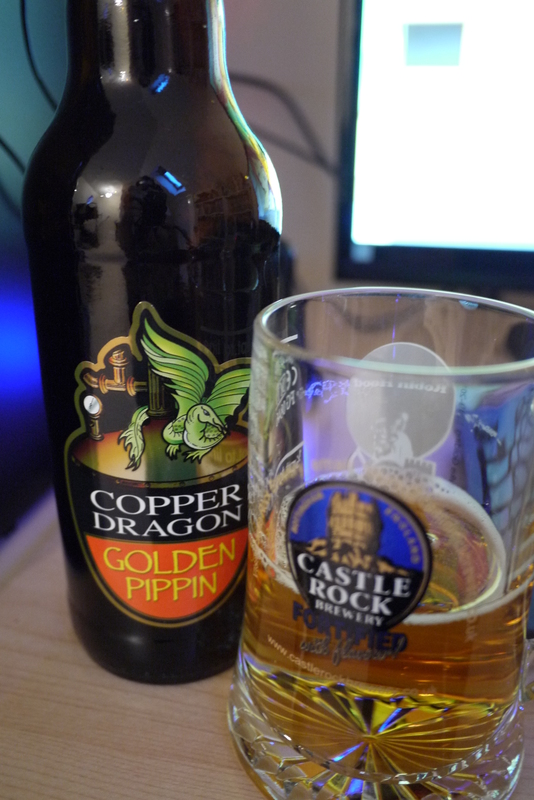 The golden pippin was quite bitter and beyond average. While the Ruby ale was plesant, if quite like a newcastle brown. Cant see it very well but the bottle is oval shape rather than like a cylinder. 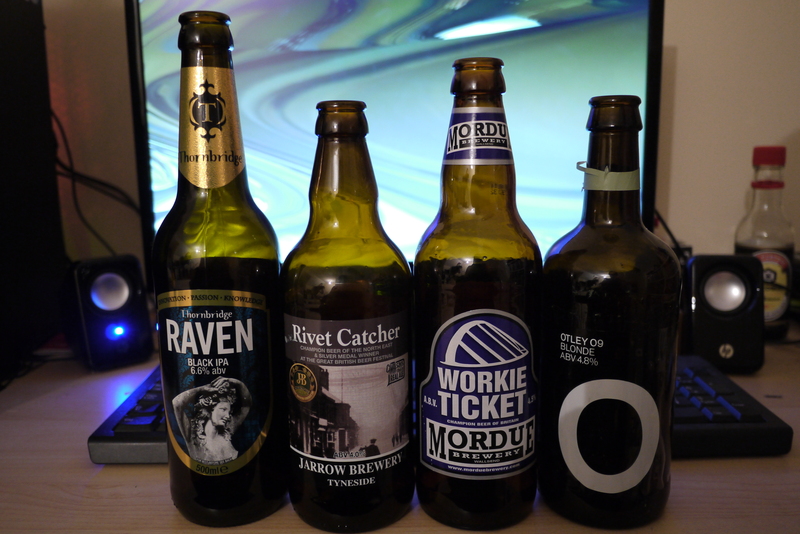 Also from the left, Thornbridge Raven black ipa at 6.6% was really bitter and became even more so while drinking, would like to try some of the other breweries beers though. Next is Rivet catcher from jarrow brewery at 4% was the one I was drinking while sorting this post. Did have a nice taste, but quite forgettable, yet it felt like i had it for a long while so it doesnt glide down that well either. Mordue brewery bring us Workie ticket at 4.5%, I nearly didnt put this one up due to it being so average…. and yet I find myself keep on picking it up, its quite morish and leaves you wanting more, malty without a strong aftertaste. Finally we have Otley brewing company standing at 4.8% with simply Blonde. 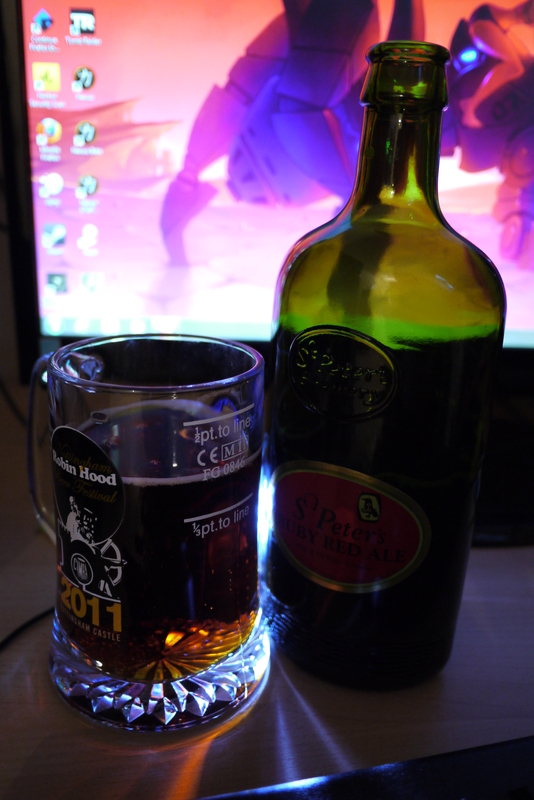 Even though I knew it was a bottle conditioned drink, that didnt stop me poaring to much into my glass…. a cloudy drink awaited me. But I dont mind. The first thing my brain did upon first sip was think ‘not as good as bitter and twisted’ hmmm good start. It was very unoffensive and didnt linger. I would say If your into blonde ales then give this a whirl but there are better ones out there. 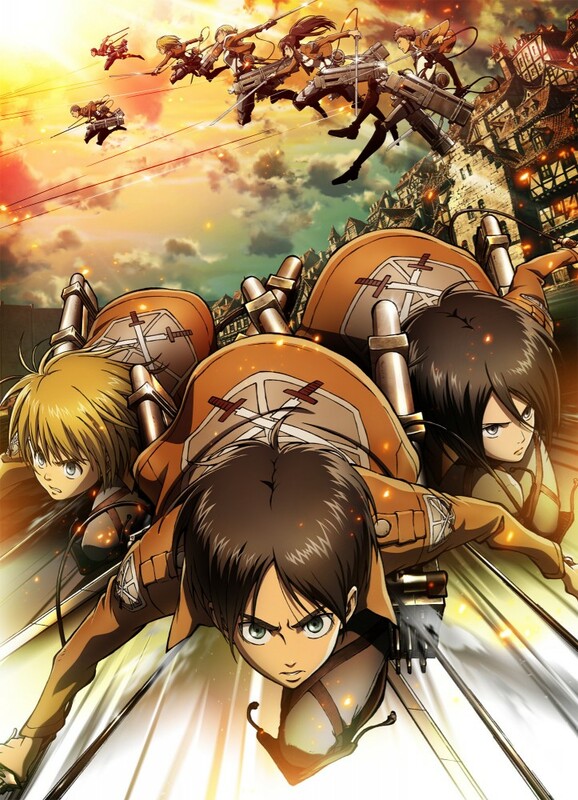 Back when this series was only 5 eps strong i was ready to praise its glory and tell people to watch this… but now… its taking the piss. Sorry there has been nothing new for a while. I’ve been busy with work stuff and that will continue for a little while (I work in a cinema so naturally summer is busy) though I do have some time off soon. Might try something different with some movie reviews when I get the time. 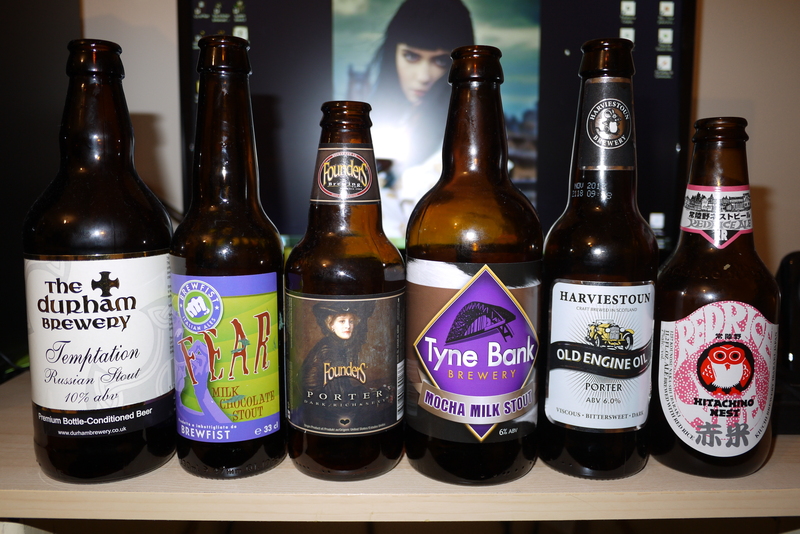 Plus I’ve seem to have drunk most of the different beers I can get in my local vacinity so I will have to look harder!